Barrier Group Pty Ltd offers durable injection moulded plastic dots for marking car parking bays. These car park marking dots or delineators can be fixed to asphalt with a galvanised nail or alternatively onto concrete surfaces using a suitable two-part epoxy adhesive system. The marking dots can be used to replace conventional line markings that may fade over time. Each marking dot is sold separately and supplied with a galvanised fixing nail. 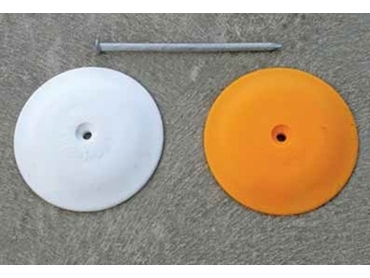 The marking dots are available in white or high visibility yellow, and are 100mm in diameter.